The 39.6 metre motor yacht Alice’s Restaurant, listed for sale by Joe Majcherek at Gilman Yachts, has been sold with Andre Bouse and Chris June at Worth Avenue Yachts introducing the buyer. Built by in GRP by US yard Westport to ABS class and MCA coded, Alice's Restaurant was delivered in 2011 as a tri-deck motor yacht and has accommodation for up to ten guests in five cabins. The master suite is situated on the main deck and has a king size bed, study and en suite bath. Below there are two VIP suites with king sized beds and two twin cabins. All guest staterooms have full en suite facilities and entertainment systems with on-demand films and music available from a Kaleidescape server. The large main saloon features a 50-inch LCD television screen, surround sound and a Yamaha Disklavier piano while just forward is a formal dining room with seating for up to ten people. With a bar and flip-down 40-inch television, her aft deck is ideal for entertaining. Up on the skylounge, located aft of the pilothouse, is comfortable seating, a full wet bar, fridge, icemaker and 50-inch LCD television screen with surround sound. She recently underwent her five-year ABS Inspection and Cayman Island flag inspection, both completed with flawless results. Furthermore, an MTU 1,500 hour service was completed along with a full service on both generators to ensure that her new owner will be able to take immediate delivery and start cruising. 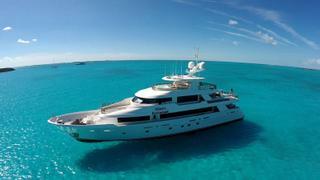 A popular charter yacht, she has twin 2,735hp MTU engines giving her a maximum speed of 24 knots. Alice's Restaurant was asking $13,750,000.